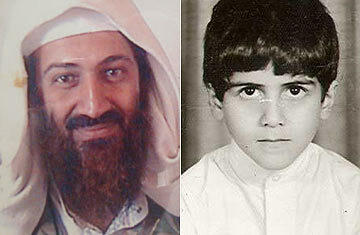 For Omar bin Laden, the fourth eldest of Osama bin Laden's 20 known children, the awful realization that his father was a terrorist mastermind who was plotting a global conspiracy that would destroy the lives of thousands of innocent people and even his own family came gradually. Of course, there were warning signs: Omar's childhood was marked by regular beatings and survivalist training; the growing army of ruffians and retainers who called his father "Prince"; and that Afghan mullah who had given his father an entire mountain in Tora Bora. But as he recounts in a book co-written with his mother, Omar  now 28 years old  found it hard to give up hope that a man who had killed so many people might one day turn his back on violence and become a normal father. The younger bin Laden fled Afghanistan only when it become clear that Osama was planning a massive attack on the U.S., but he still couldn't accept that his father was responsible for 9/11 until months later, when he heard the familiar voice on audiotape claiming credit for the attacks. "That was the moment to set aside the dream I had indulged, feverishly hoping the world was wrong and it was not my father who brought about that horrible day," he writes. "This knowledge drives me into the blackest hole." As the first book written about Osama bin Laden with help from anyone in the bin Laden family, Growing Up bin Laden: Osama's Wife and Son Take Us Inside Their Secret World (St. Martin's Press) is a valuable  if limited  glimpse into the personal life of the world's most wanted man. In recollections from Omar and his mother Najwa bin Laden (the first of Osama's five known wives), and with the assistance of American author Jean Sasson, the book paints a picture of Osama as a towering figure whose noble demeanor inspired fierce loyalty, but also an absolute authoritarian who wanted as many wives and children as possible in order to have foot soldiers for Islamic jihad. "My sons, your limbs must react to my thinking as though my brain was in your head," he told his children when they complained about their life in al-Qaeda camps. However, Osama the father remains almost as elusive to his son (and the reader) as he is to the FBI  too consumed by jihad to care much for his children, too distant to seem like a full person. But Omar's memoir  which forms the core of the book  presents a strange and fascinating coming-of-age-story about a young boy who was groomed by his father to take over a worldwide terrorist enterprise but who instead chooses to get a job, start a family and play with animals. If the book suffers somewhat from the limitations of translation and overly formal prose, the thrill of being a fly on the wall of the bin Laden family drama quickly takes over. Omar's early childhood is both charmed and abusive. Though the family inhabited a mansion in the Saudi city of Jeddah and owned horse ranches in the desert, their father refused to let them have toys, take modern medicine or use almost any modern conveniences except for lightbulbs, automobiles and firearms. Though Osama would punish his boys for laughing or smiling and send them on forced marches in the desert without water, Omar and his brothers could at least console themselves with the honor of being sons of the man who helped defeat the Soviet Union in Afghanistan, a hero in both the Muslim world and the West. "When I was a young boy, I worshipped my father, whom I believed to be not only the most brilliant, but also the tallest man in the world," Omar writes. "I would have to go to Afghanistan to meet a man taller than my father. In truth, I would have to go to Afghanistan to truly come to know my father." The nightmare began in earnest after the Saudi government banished Osama from the kingdom for railing against Riyadh's decision to allow American soldiers on Saudi soil to repel Saddam Hussein's invasion of Kuwait. From the new family home in Sudan, while Osama plotted to overthrow the Saudi monarchy and the American government, Omar noticed some dangerous new arrivals in their Khartoum neighborhood, including Ayman al-Zawahiri, the leader of an Egyptian Islamist movement who would become al-Qaeda's second-in-command. When members of another extremist group raped one of Omar's male friends, al-Zawahiri took justice into his own hands  by executing the victim.